The New England Championships were held at University of New Hampshire in Durham on Saturday, and there were several outstanding performances for Maine athletes. Cayden Spencer-Thompson took home the most hardware of all Maine athletes. The junior won the long jump, breaking the all-time Maine record in the event with a final jump of 24 feet, 1.75 inches. The mark surpassed the previous best of 23-05.5 set by David Eagleson of Kennebunk back in 1990. Spencer-Thompson would then come back to win the triple jump, jumping an outdoor personal-best of 48 feet, 3.75 inches. His distance in the long jump is currently tied for the ninth-best mark in the country, while his 48-03.75 ranks 11th among all juniors. Westbrook junior Nyagoa Bayak earned her second New England championship of her career in the high jump as she cleared 5 feet, 11 inches, tying her personal-best. Bayak's 5-11 currently sits as the sixth-best mark in the country. Both Spencer-Thompson and Bayak presume to continue their seasons at New Balance Outdoor Nationals in Greensboro, North Carolina, which starts on June 15. 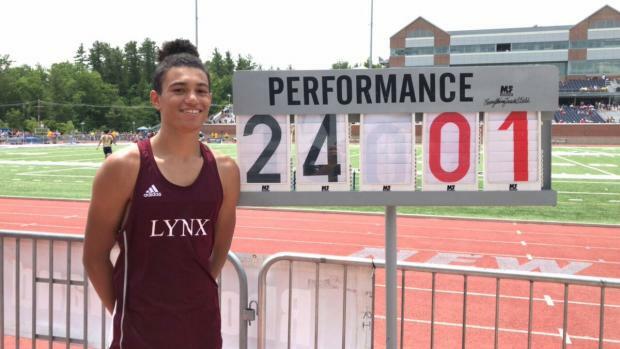 After finishing second at this meet last year, Thornton Academy junior Travis Snyder won his first New England title in the pole vault. Snyder cleared 15 feet, 9 inches, breaking his previous PB by ¾ of an inch. The clearance is tied for the 20th best mark in the country among all juniors. Another Trojan took home a New England title, as Jason Montano won the shot put. Montano threw 59 feet, 2.5 inches to set a personal-best in the event, while leading a strong Maine contingent in the event. Brewer's Garrett Graham took fourth, throwing 55-00.25 feet, while Mount Desert Island's Croix Albee was eighth with a throw of 53-02.25 feet. Montano also took sixth in the discus, throwing 155-11 feet. It was Brewer's Jacob McCluskey winning the event, throwing 168-01 feet. That's McCluskey's second top-three finish in the event at New Englands. There were also plenty of standout performances from Maine athletes who didn't walk away as individual winners. 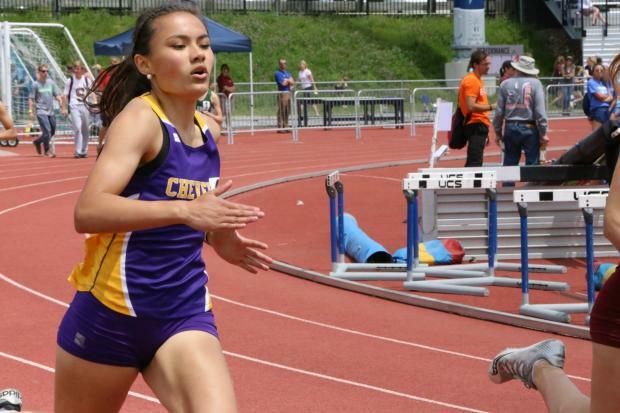 Putting in the most impressive performance from a non-winner had to be Victoria Bossong of Cheverus. The freshman took second in the 400 meters, running 56.27 and shaving close to .7 seconds off her previous PB. The time is also a state record, and the 26th fastest in the country among all freshmen. Maranacook's Molly McGrail took 11th in the event, running to a PB of 58.94. Bossong's teammate, Emma Gallant, wasn't too far behind, finishing fourth in 57.41. The time is a season-best for Gallant. Gallant and Bossong each ran legs on the Stags' 4x400 meter relay team, which finished sixth overall in a time of 4:01.61. Gallant and Bossong weren't the only Stags getting all the shine on Saturday. Junior Emma White took seventh in the triple jump with a distance of 36-07.5 feet. Old Town senior Oliviah Damboise followed in eighth place, jumping 36-06 feet, while Gorham junior Evelyn Kitchen was ninth with a mark of 36-05.75. Cape Elizabeth's Darcy Cochran picked up a pair of third place finishes in the 100 and 300 hurdles. Cochran ran 14.91 seconds in the 100 hurdles, becoming the third Mainer to break 15 this season. She then ran to a fine time of 45.39 in the 300 hurdles. Scarborough's Emily Labbe finished eighth in the 100 hurdles in 16.81 seconds. Hampden Academy's Helen Shearer took second in her heat of the 3200 meters, running 11:11.16 en route to a ninth place overall finish. The time shattered the sophomore's previous PB by more than 12 seconds, and is also a state-leading mark. Orono's Camille Kohtala took eighth in the long jump, jumping to a PB of 17-07.5 feet. Sarah Cox of Waterville was another standout athlete, as she finished eighth in the discus (121-09 feet) and 10th in the shot put (38-08). Cox's mark in the discus is a PB. Lauren Berube of Edward Little took ninth in the pole vault, clearing 10-09 feet. In the 200, Belfast's Junne Robertson-McIntire finished 12th overall, running 26.15 seconds. The top Maine finisher in the 800 was South Portland's Anna Folley, who finished fourth in her heat running 2:19.39 en route to a 14th-place finish. Bonny Eagle's Christine Toy took 10th in the 1600 to lead a solid Maine contingent. Toy finished in 5:13.82, while Greely's Carolyn Todd (5:15.08) and Marin Provencher (5:15.42) were right behind in 11th and 12th respectively. York's Zach Westman took third in the 300 hurdles, running 39.22 to break the school record and set a PB. Westman has run under 40 seconds on four occasions this season. Brunswick's Samuel Cenescar had a great day in the high jump as he tied for seventh, clearing 6-05 feet. Scarborough's Anthony Clavette took 11th clearing a PB of 6-03 feet. Mt. Ararat sophomore Lisandro Berry-Gaviria had a strong showing in the 1600 as he won his section, running a PB of 4:23.48. The time was good enough for a ninth-place finish. Traip Academy's Dalan Hubbard was the top Mainer in the 800, finishing 11th in 1:57.36. Wyatt Lord of Hampden Academy was 14th in a PB of 1:58.03. Mount Desert Island's Griffin Maristany won his section of the 400 meters in a PB 50.65 seconds to finish ninth overall. Maristany also finished 22nd in the 200 meters with a PB of 22.92 seconds. Cheverus's Sean Tompkins was the top Mainer in the 200, running 22.67 seconds finishing 14th. Bangor's Gabe Coffey finished third in his section of the 3200, running 9:43.24 to take 16th overall. That time is a PB.